I’m going to wrap up my thoughts on what makes a quilt interesting, with some comments on how a quilt’s story contributes. To remind you, I’m specifically talking about quilts that might be used as a bed or lap quilt, and not art quilts or wall-hangings. Also, if you’d like to read more on this, see the first three parts of this here, here, and here. Take a look at comments, too, as they offer more to the discussion. Let me clarify that these posts are about how a quilt (or other object) appears visually, and what characteristics lead one to spend more time looking at it. But when a story helps us appreciate the look, the story is significant, too. This is a pillow I made for my son. With the buttons pulling at the placket, it looks like a shirt too small for its wearer. Not really an attractive look. 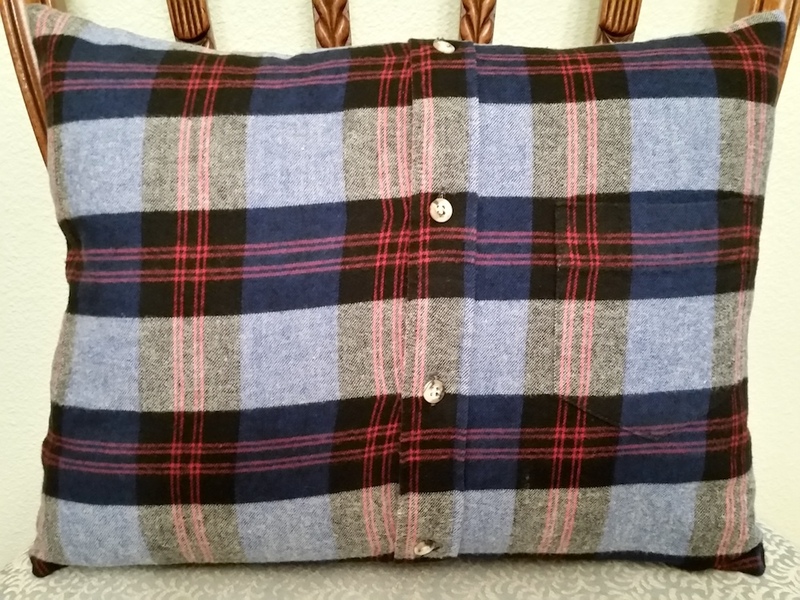 Once you’ve noticed that it is a shirt repurposed as a pillow cover, there isn’t anything else to see. Not interesting, and no reason to keep looking at it. I could have posted a photo of it with no explanation. Instead, I told you a story about my son and about the shirt. Based on the reactions in comments, it seems the pillow is more interesting than it appears at first glance. Stories can be told about the object itself and why it is important, or about the process of making, or about the owner. They can be embedded within the object or thoroughly outside of it. Because quilting is a visual craft, we can use symbolism of color or shape, and we can include words and ideas, to convey meaning or story. Take a look at Kerry’s beautiful quilt she has basted and ready for hand-quilting. It is a sampler with quotations embroidered onto several of the blocks. At least part of the story in her quilt is apparent. And it is that story that will help keep the viewer looking, until their curiosity about the quotations and variety of blocks is satisfied. 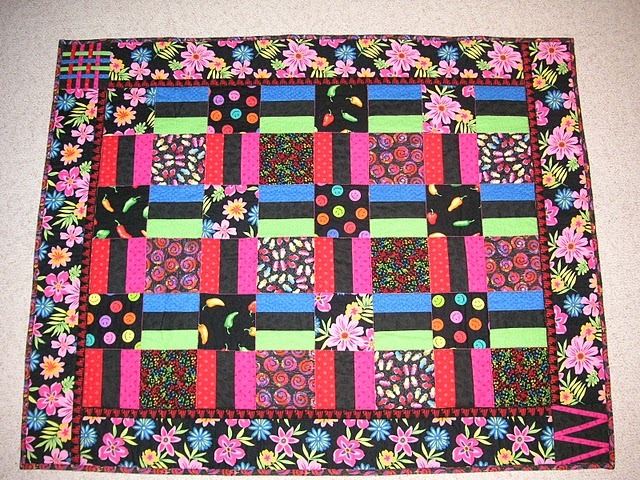 Another example is a quilt I made for a family friend, for her high school graduation in 2007. Ten years ago I was an early quilter, and the fabrics I chose were more important, symbolically, than the design. Whitney’s graduation quilt. Lap quilt sized. 2007. Without close-ups, you might not be able to see the various prints. There are musical notes, in honor of her experiences in high school band, and smiley faces, to signify her multiple dental surgeries and teeth-bracing episodes. The flip flop sandals note her favorite footwear, and the narrow border is a long line of coffee cups, to celebrate her work at a local coffee shop. In the lower right corner is a “W” for her first name. And in the upper left corner is a plaid I created from strips of colorful fabric. The plaid is to commemorate her friendship with my son. (Plaid!) 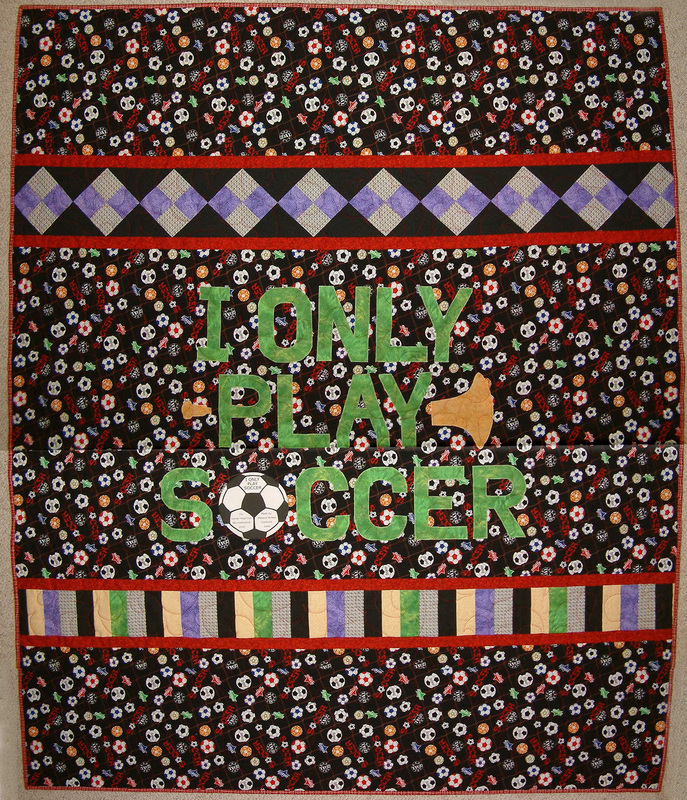 Unlike with Kerry’s quilt, this quilt’s story is best read by someone who knows the owner. Another quilt, made in 2010 for another of Son’s friends, has a very long back story. What you see in this picture is the punchline. Notice that besides the soccer ball, there is a trumpet behind the word “PLAY.” In addition to the words and pictures, the pieced bands use Dan’s high school and university colors. Dan’s college graduation quilt. This is actually the back of the quilt. 2010. I still use fabrics to convey meaning. 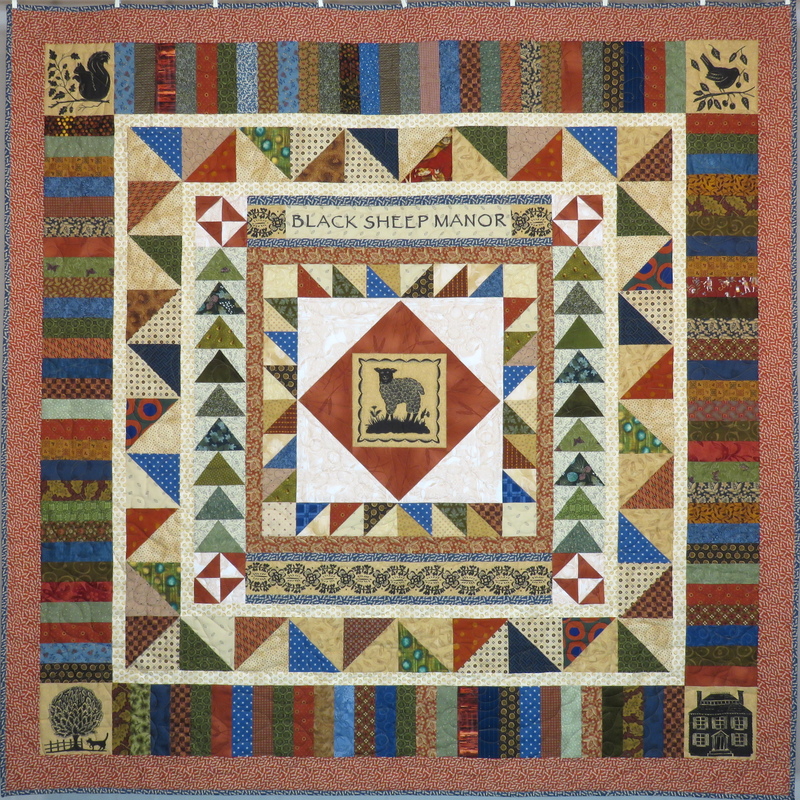 My recent quilt, Black Sheep Manor, includes a variety of prints that the owners may notice over time and attach meaning to. Besides the fabrics, I’ve also used piecing to add significance. For instance, in a note to the owners, I explained the “piano keys” border as books, tremendously important in their lives. The middle border of half-square triangles also was intended to have meaning to them that others would not find. If you’re familiar with Antiques Roadshow, you know that an object’s provenance can be an important aspect of its monetary value. What you might not know is that provenance or story can add value to a wide range of objects, not just antiques. … would purchase cheap trinkets, ask some of today’s most exciting creative writers to invent stories about them, then post the stories and the objects on eBay to see whether the invented story enhanced the value of the object. Which it did: The tchotchkes, originally purchased for a total of $128.74, sold for a whopping total of $3,612.51 — a 2,700% markup. “It turns out that once you start increasing the emotional energy of inanimate objects, an unpredictable chain reaction is set off. I encourage you to read the whole article at BrainPickings. Our quilts carry stories with them. Some stories are only obvious to the makers, as described in my post Transforming the Past| Transforming the Future. Some are obvious also to the intended owners. I believe we honor the tradition of quilting when we are aware of this, and let our quilts tell stories. I believe we can find the process of making more meaningful when we incorporate stories, as well. Do your quilts tell stories? Are the stories mainly for your own benefit, or ones that anyone can see, or specific only to the owner? Do you have any other follow-up thoughts about making quilts that are interesting for the viewer? This entry was posted in Quilting and tagged Design, Designing, Original design, Stories, Story on December 21, 2017 by Melanie McNeil. In my last post I talked a bit about why color draws us to appreciate some quilts more than others. Besides color, per se, unexpected color combinations might be more important in finding a quilt interesting. 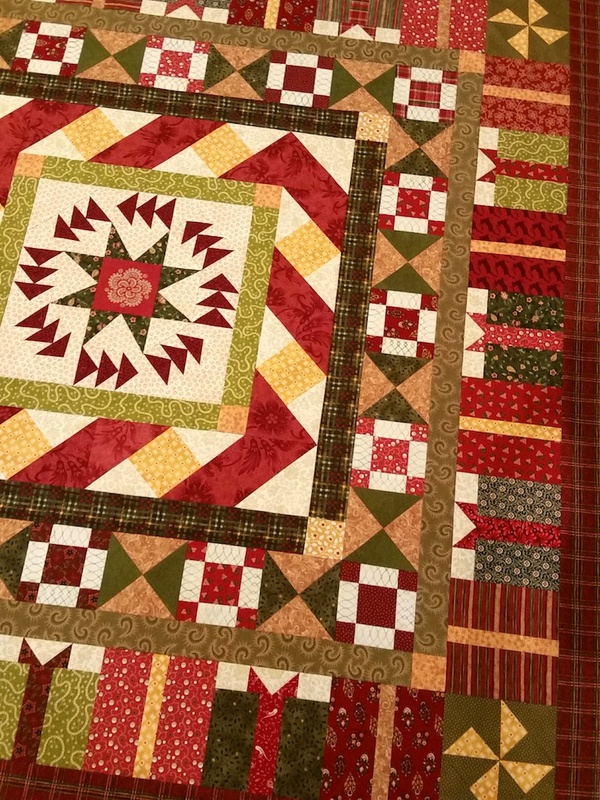 Two other factors that might make a quilt interesting are the combination of fabrics and any story about the quilt’s design, the making of it, or the owner. When I think about the combination of fabrics, I’m thinking about the impression the fabrics make aside from color or value. For example, within a color group, or within a value group, are there differences that draw the eye? Are there details that contribute to the look or feel of the project? One strategy that can be effective is to repeat a pattern design in multiple fabrics across a quilt. For example, you might use multiple leafy prints in various ways, or multiple dots, or plaids. When the viewer notices the second paisley, they might naturally search for a third. That search keeps the viewer attentive to the quilt — something about the quilt must be interesting to warrant it. I don’t often take many close-up photos of my quilts (must change that …) , but recently I shared several pix of my seasonal quilt Christmas Is Coming! 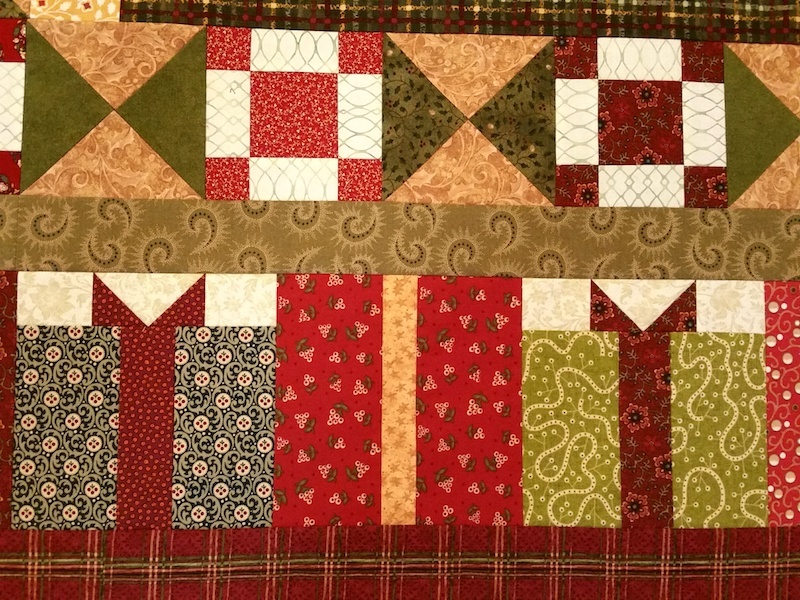 These show that the fabrics are mostly in reds, greens, and golds, not unexpected in a Christmas quilt. Imagine if all the reds were done in only three fabrics. Imagine if all the greens were in one lighter green and one darker green. Imagine if all the light-valued “background” fabrics were the same throughout the quilt. Imagine if there were only one gold. Would it be as much fun to look at? Imagine snuggling under this quilt for a nap, or to read a book. Would a quilt in seven fabrics keep you looking from block to block as it drapes across your lap? What else would be missing with fewer fabrics? The feeling would be missing. 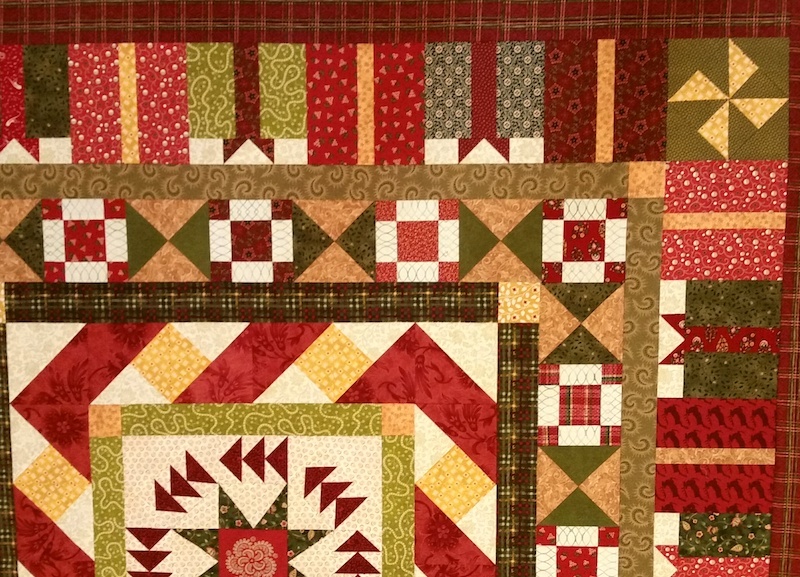 I designed this quilt to be festive, and to include a sense of whimsy. The feeling created by the combination of fabrics leads directly to emotional engagement, one of the things that draws the viewer in to look more. In this case, more fabrics makes it more interesting. 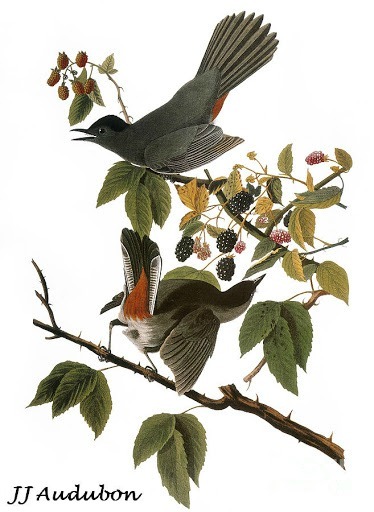 The set includes a broad array of styles and variations on the core colors. I wouldn’t say that more fabrics is always better. I’ve seen fabric lines that, even with lots of print designs, don’t offer variety of style, or much range of color. Creating a quilt using just one fabric line can make it look “matchy matchy,” or excessively coordinated. And that, in my opinion, takes us back to quilts that must depend on something besides the fabrics to be interesting. In general, I find scrappy quilts to be more interesting than those made with fewer fabrics. But your mileage may vary! 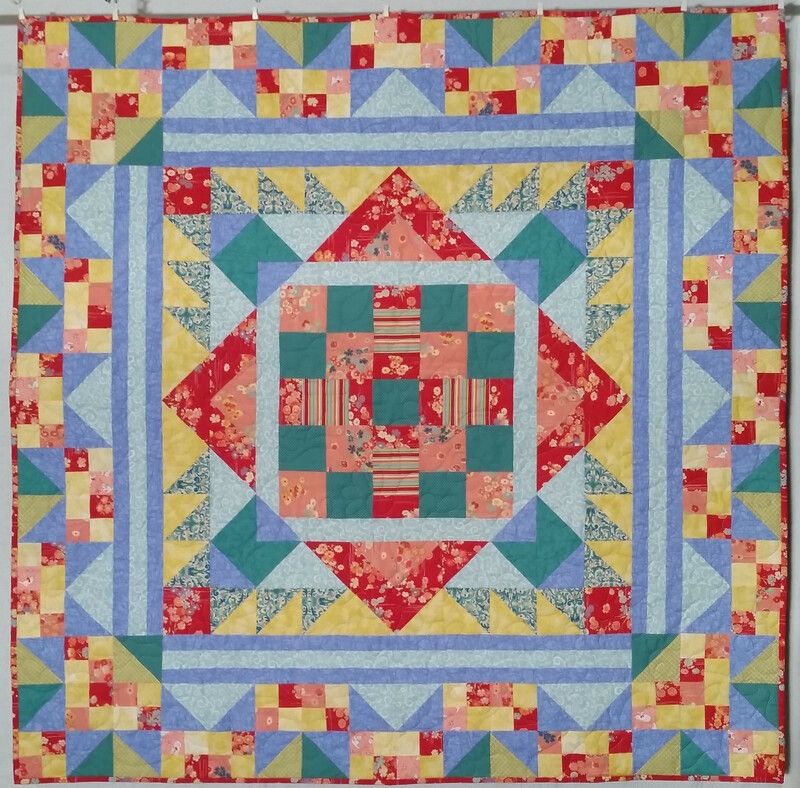 What do you like when looking at quilts made by others? What do you like when making your own quilts? In what will probably be my last post on making quilts interesting, I’ll talk about how story contributes. This entry was posted in Quilting and tagged Design, Designing, Fabrics, Original design, Quilts from scraps, Scrap quilts, Scrappy quilts on December 19, 2017 by Melanie McNeil. Not just beautiful, not just well-crafted. What makes a quilt interesting, one you want to look at for a long time? One that keeps bringing you back to it? In these questions, I am not thinking of “art” quilts or wall-hangings. Rather, I’m thinking of quilts, whatever their style, that might be used as a bed or lap quilt. 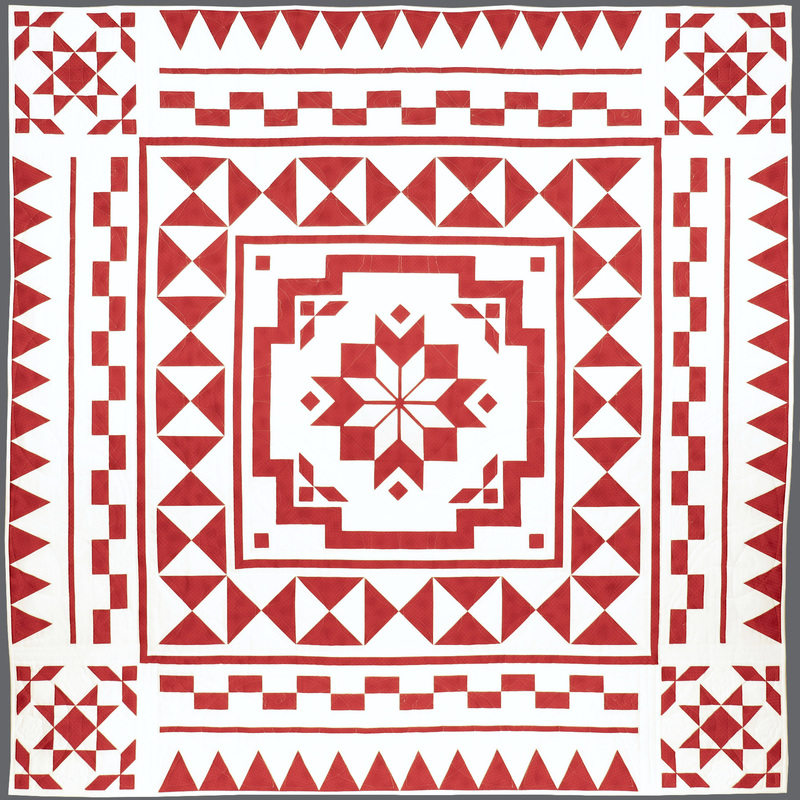 What design characteristics make a quilt interesting? Is it easier to answer if asked what makes a quilt boring? Here are two quilts I made in 2017, for comparison. In some ways they are the same, with solid white backgrounds and lots of open space. They are both “pretty,” I think. But one is more interesting (to me) to look at than the other. Dizzy. 60″ x 60″. 2017. Photo by Jim Ruebush. Fire & Ice. 68″ x 68″. 2017. Photo by Jim Ruebush. So what’s the difference? In some ways, Dizzy is more interesting than Fire & Ice. Dizzy has more colors. It’s kind of fun to track the block colors back into the floral print border. There’s more value differentiation in Dizzy than in Fire & Ice. But to me, Fire & Ice keeps my eye for longer. There is more to it that is unexpected, or requires more time to consider. There are more shapes and different angles in it, while Dizzy has only two basic blocks, the pinwheels and the variable (sawtooth) stars. In Dizzy, the blocks’ colors are also symmetrically arranged. If you see one quadrant of the quilt, you don’t need to see the rest. While that is essentially true for Fire & Ice, the repetition alludes to other shapes, rather than directly repeating. The outside corner blocks use a “wing” shape from the center block, but they frame different shapes. The solid red lines are various widths. The center block suggests some puzzles to its construction. The positive/negative space use of alternating hourglass blocks creates the main movement. Besides, that, the design of Fire & Ice is far from perfection. The proportions of shapes are not quite right. The border of alternating bars has an even number, meaning the line is not symmetrical. There’s a lot of white space in the final wide border, especially as compared to the hourglass border. Some shapes are big and some are small. The lack of perfection is exactly what makes it most interesting. To me, it’s useful to consider what makes an interesting quilt, because I want to make quilts that are interesting. I want to make quilts that someone might linger over for a long time, taking in the details. Ones that have a story to tell through their design. Ones that carry little surprises. Ones that pose some challenges in the making. What characteristics make you linger over a quilt? Why do you keep looking? 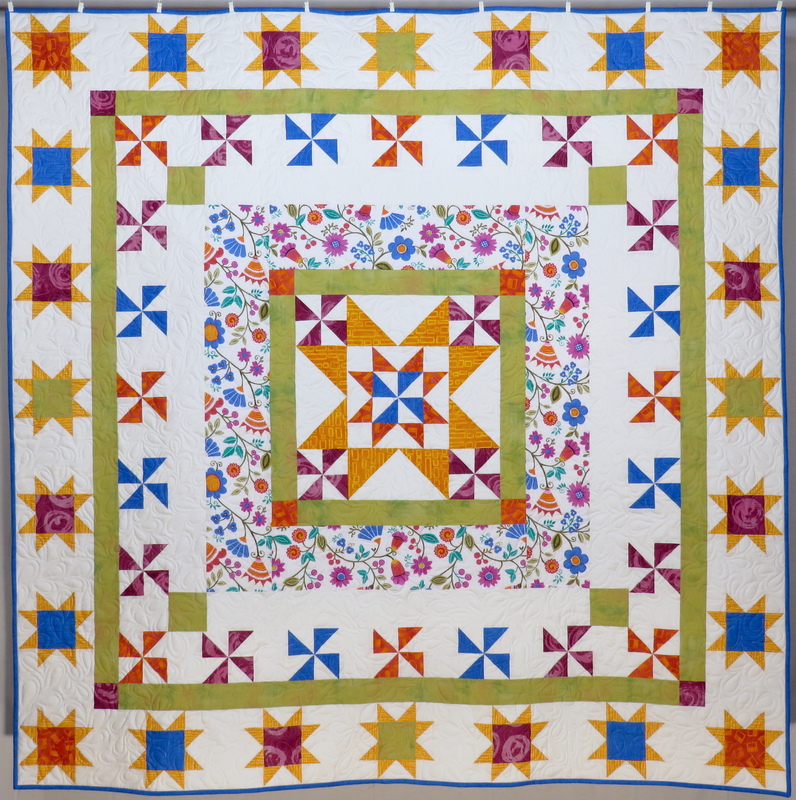 When you think of your own quilts, which ones do you still enjoy looking at, and why? When you think of “interesting,” what do you think of? 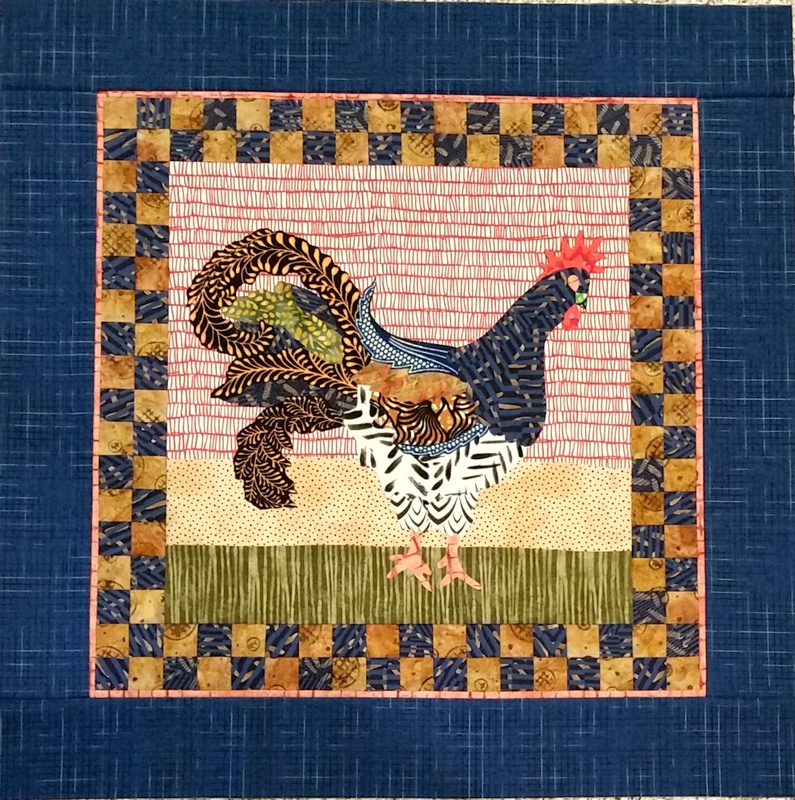 This entry was posted in Creativity, Quilting and tagged Design, Quilt design on December 16, 2017 by Melanie McNeil.